St. Francis by the Lake has a vibrant mission life. Through these activities we strive to help to improve the quality of life for those around us who are in need. Fr. David likes to say "What we are is God's gift to us. What we do with who we are is our gift to God." 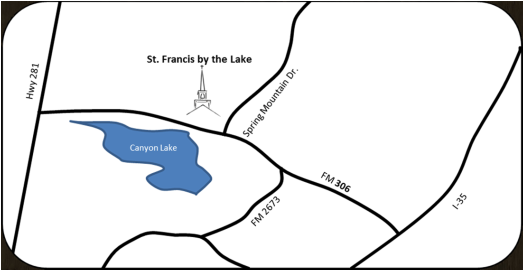 Any woman who is a member of St. Francis by the Lake is a member of the E.C.W. While fellowship, prayer, support, and encouragement are our aims, we also look outside ourselves to provide a variety of charitable services to the parish, as well as the community. The women meet on the second Thursday of each month for fellowship and a program of interest to members. Community of Hope at St. Francis by the Lake is a community of lay volunteer pastoral caregivers united in prayer; shaped by Benedictine spirituality and equipped for and serving in pastoral care ministries, which involve compassionate listening and responding to the spiritual needs of those around them. Pastoral caregiver training is conducted every other year using the Community of Hope International curriculum and models. After training is completed, individuals may choose to be commissioned for service. Identification and discernment of each person’s ministry is a part of the training journey. COH members attend monthly Circle of Care gatherings which encompass spiritual growth, continuing education, community building, ministry support and fellowship. People involved in making prayer shawls meet once a month to pray over the shawls and throws that will be given to anyone whom we find needs comfort, healing, encouragement, or for special events. Bring your project--or just your enthusiasm, and we'll help you start a project! Anyone interested in the prayer shawl ministry is welcome and invited to join us. The Manos de Dios team planted a mission in Danlí, Honduras in 2000. Since then, the team has built a worship center and a vocational center. The team continues to go twice a year to support various ministries. If you’re interested in mission work in Honduras, we would love to hear from you. The veterinary mission to SouthEast Mexico assists several mountain villages in bringing preventive medical care to their livestock and pets which are integral to rural life in the Diocese of Southeastern Mexico. Public health instruction is also provided to the families and children of the rural areas of the diocese. If you are interested in helping with this mission work, please contact us. Our mission is to reach beyond ourselves to serve people in our communities and throughout the world. St. Francis by the Lake supports a number of World Mission programs and for the past several years has sent short term missionaries to Honduras. The Diocese of West Texas has further information if you are interested in World Missions at www.dwtx.org/index.php/diocese/World Mission.